The major goal of SORCE, and of NASA’s Earth Observing System (EOS) Program in general, is to increase scientific understanding of our planet, with the ultimate product being education in its broadest forms. According to the Earth Science Strategic Plan, one of the four goals of EOS is to “foster the development of an informed and environmentally aware public.” Contributions to the advancement of public knowledge about the Earth are key to the program’s success. SORCE has several formal and informal educational undertakings. SORCE has formal educational initiatives designed for kindergarten through graduate levels that include programs to enhance teacher knowledge and research skills; provide support in the form of instructional curriculum, provide earth science research experiences for students; and promote educational activities involving collaborative efforts with partners in the public and private sectors. Children at LASP using the hands-on SORCE teaching module. 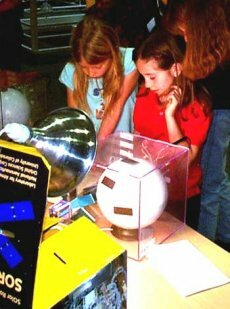 Using this educational tool, children can learn about solar variability and the need for spacecraft measurements. The SORCE informal earth science education is directed toward the scientific community and the general public. Mission literature addresses the basic science questions that SORCE will address and specifically what SORCE will accomplish concerning the Sun’s influence on climate. This literature includes brochures, NASA Fact Sheets, fact books, handbooks, newsletters, and World Wide Web sites – all comprising a wealth of information and images. The latest multimedia technologies for interactivity and data visualization are being used to encourage an interesting “hands on” approach. 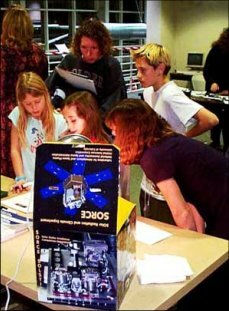 The University of Colorado’s Science Discovery Program in collaboration with SORCE researchers has developed an elementary school outreach program. This portable, hands-on teaching module has been presented in local schools and is part of the Science Discovery curriculum. The classroom demonstration shows solar variability and the need for spacecraft measurements of the Sun. A globe in a clear case represent the Earth and its atmosphere, while a variable light is the Sun. Students measure the solar irradiance from a small model of the SORCE spacecraft positioned above the “atmosphere” and from several positions of latitude on the Earth. They note the changes in the measurements as the light source varies and as the case fills with diffusing vapor, which represents our changing atmosphere. This teaches the two fundamentals that the Sun is variable and that measurements of its variability require a space-based platform.